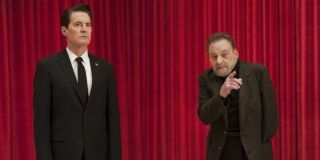 Collider Games is developing Twin Peaks VR, an interactive experience which is set inside the Red Room. The “experience” is being developed in conjunction with Showtime, the main distributor of Twin Peaks’ third and in all likelihood final series that aired last year. An announcement on the Collider website explained that Twin Peaks VR would include “iconic moments” from both Twin Peaks: The Return and the original series that premiered in 1990. “Utilizing lines and sounds from the show itself, players will travel to Glastonbury Grove, only to end up in the puzzling Red Room,” Collider wrote. “Fans of the series will follow in the footsteps of Special Agent Dale Cooper and try to make their way back into the life they left behind.” David Lynch is apparently involved too, although Collider don’t specify how. Here’s an image of Collider’s take on the Red Room. Or it might be Andy Kelly’s lounge. Hard to tell. I’m both intrigued and faintly terrified at the prospect of being able to explore the Red Room and (presumably) beyond in stereoscopic 3D. There’s never been a proper Twin Peaks game, although there are plenty of games that take direct or indirect inspiration from Lynch’s landmark TV series. Alan Wake is the most obvious one, although sadly you can’t buy that on Steam anymore. Elsewhere, Life is Strange has a major Twin Peaks vibe, as does the indie game Virginia, although personally I didn’t like that at all. Even Ron Gilbert’s new adventure game Thimbleweed Park has more than a little Lynch about it. Twin Peaks VR is being developed for both Oculus Rift and HTC Vive, and will be available on Steam. There’s no word of a specific release date yet, but the game will make its debut at David Lynch's Festival of Disruption in Los Angeles, which takes place through October 13-14 at the The Theater at Ace Hotel. If you’re in the area, you can buy tickets for that event here.